With summer now here it’s an ideal time to remind people of the risks of hot temperatures and cars… And to install a Sydney carport! Every year in Australia, children and pets are put in significant danger by being left in cars on hot days. In fact, in a recent one-year period alone, well over 1000 children were rescued from an unattended car. And that was in one state alone. The temperature inside a car can be 20 to 30 degrees hotter than outside temperatures. So on a day of 30 degrees, which is certainly not uncommon in Sydney at this time of year, the inside car temperature can be between 50 and 60. On a 40 degree day, it can be between 60 and 70 degrees! A child or pet can be in serious danger in a short time in these temperatures. While hopping into a car that’s been left in the sun on a hot day isn’t likely to be a danger to your health, it’s certainly not pleasant. While you may be limited in what you can to reduce this discomfort when out and about, at home there is a simple answer – build a carport for your Sydney home. A carport will keep the sun off your car, significantly lowering the inside temperature. So instead of hopping into what feels like a Turkish steam bath, you can enjoy more comfortable temperatures even on a hot day. 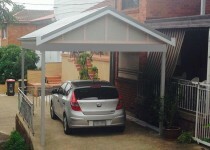 Of course, a well-designed Sydney carport won’t just be valuable on hot days. It will also protect your valuable assets and be a blessing in the rain and on frosty mornings.